New Transit Line Can Stitch St. Louis Together. But Can It Beat Parochialism? 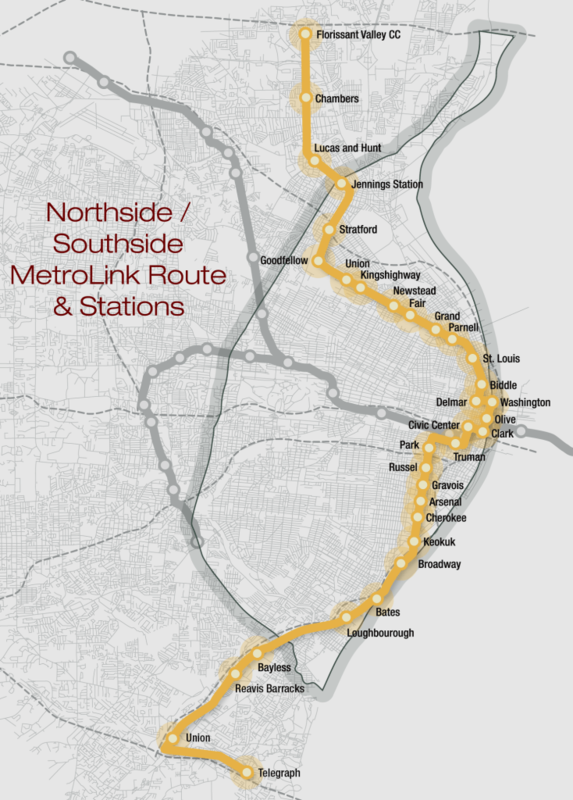 It’s been 20 years now since planners in the St. Louis region first envisioned a north-south route for the Metrolink rail system. The region’s rail system is currently oriented in an east-west pattern. Outgoing St. Louis Mayor Francis Slay recently made a move to advance a transit project that would improve access to jobs for residents of economically struggling areas north and south of the city. Slay is seeking a $500,000 FTA grant to study the rail line. But the political rivalries that have made St. Louis a poster child for regional dysfunction are already surfacing. St. Louis County Executive Steve Stenger refused to support the city’s application because, he said, the north-south line will “divide” the region. So what in the hell is Stenger thinking? He’s playing the classic role of political “leader” in our fractured region. He hangs his argument on representing “more than one million citizens” and St. Louis County being the largest local funder of Bi-State [Development, the agency that runs Metro-Link]. In short, it’s ours-ours-ours and who cares about what a transit system is, or how it could affect the region. In that respect, his opposition is somewhat predictable, and yet still absurd. Leaving other arguments alone, a north-south rail line reaching, and likely extending into, north and south St. Louis County, is by far the wisest transit investment for the county. While central and west county are economically successful, increasing poverty, declining jobs (and so access to jobs) both north and south present massive challenges. Connecting these areas to jobs and education, preventing economic decline, is the challenge of the coming decade. Elsewhere on the Network today: Reinventing Parking refutes the notion that parking requirements function just like taxes to support public schools. The Wash Cycle reports on a recent study that found people who get to work by walking or biking in Virginia are most satisfied with their commutes. And The Urban Edge reports El Paso is looking to give residents more freedom to get around without a car by building out a bus rapid transit network.